Having returned to WOYWW last week, here I am again (I feel the addiction creeping back already!). I enjoyed visiting other workspaces and thank everyone for visiting me and for leaving me comments. So here I am for WOYWW 275 - if you don't know what I'm talking about, click on the link and see Julia's post and then have a nosey at the other workspaces that are shared. Last week I shared pictures that showed me accommodating my new toy, the Scan n Cut and later in the day I made a card that I linked to. So, back to the Scan n Cut - last night I decided to have a look at Birds Cards where there are loads of free svg files that can then be converted to suitable files for the Scan n Cut using Scan n Cut canvas. I downloaded a lattice file and cut - probably not the best to start with, because it's very fiddly to get all the bits off the mat, but hey ho! It's 7 x 7, so I intend to use it on an 8 x 8 card ... but I'm not sure how or what for! Think I might make something to go under it using my gelli plate with acrylic paint or distress ink, but haven't decided yet. Think I need to stop playing for a while and get back to doing things that need to be done. Watch this space! 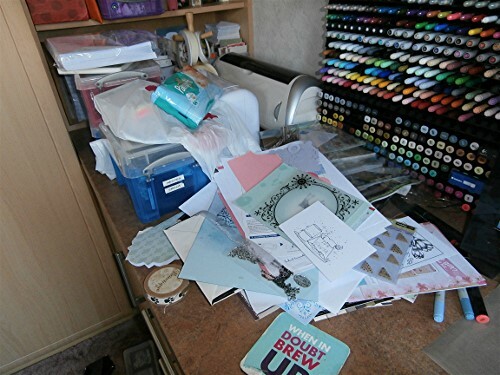 Oh, and this is a picture of the workspace to the left of where I sit - thought I'd include it for those who think that I'm always neat and tidy! The scan and Cut looks like it does an amazing job. I think we all have a little corner of bits and pieces. Thanks for popping over to mine and for your lovely comments. So lovely to see new toys and to see what you do with them....that looks to have real potential :- ) have fun. 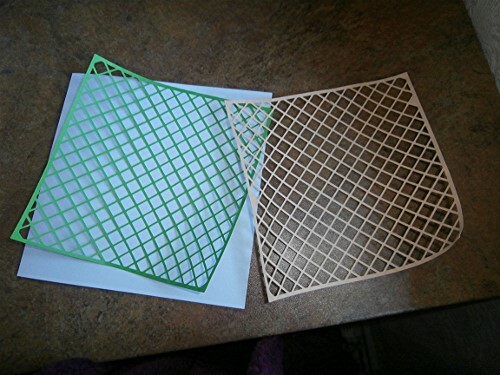 The lattice is amazing, I bet you'll use it for all sorts of things. But my fav thing on your post? That gorgeous wooden box you've sorted your stuff into. That is very nice indeed! Your gardening box is a pretty cool stamp holder! Are you going to leave it plain or decorate it? And the lattice is amazing! 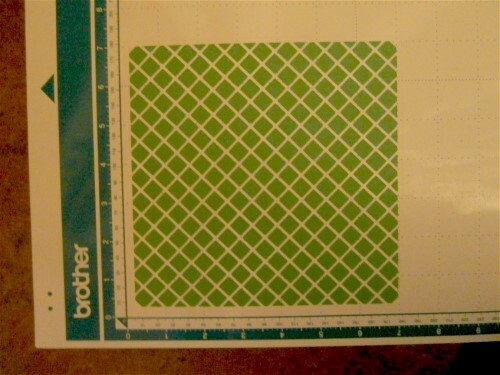 I have issues with my Cricut mat with the itty bitty pieces. Love your busy desk! Happy WOYWW and thanks for popping by! 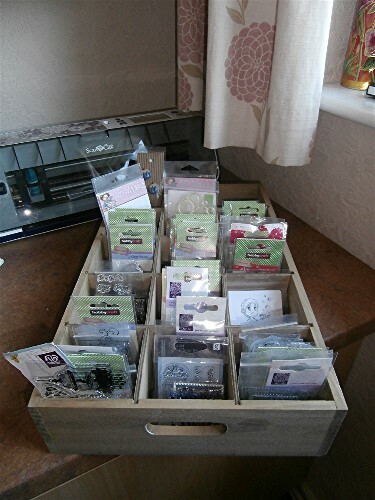 What a great idea for stamp storage and what a tricky cut to start things off with the scan n cut. You need a scraper to get all of those bits off super fast. Have creative fun and thanks for visiting. Hi Hazel, Thanks for visiting me and leaving a comment. Your box looks very useful. I reckon it's a box to put seed bags in. What a good idea! I'm glad you've been able to play with your scan 'n cut machine. If it can do something as intricate as that lattice, I'm sure it can tackle anything. Hazel, you have some awesome arty toys, you lucky lady! How fun! Thank you for stopping by this woyww-you're right, it really is addicting, and I miss it when I can't play along. Now you have all that confetti left over from your lattice cut out. :-) Hope you find more time to play! Thanks for for the blog visit and the comments earlier. Love your gardening box and the lattice work is just beautiful. Thanks for sharing! Love the oganisation of the stamps and the pens look great and very easy to access. I recognise the free gift on your table, I have that too but haven't used it yet. That scan and cut sounds like it would be fun to play with and the possibilities seem endless. I also love you marker collecting and storage unit. Happy WOYWW and Blessings! love your messy desk and your marker storage. Oh my.... I hadn't heard about that machine yet. Now I have looked it up, and I am in love. That storage thing for the markers looks great! Once (if, someday) I can have my own hobby room with a lock or old enough kids to not mess with the stuff in it, I want something like that too. Thanks for paying my craft room a visit - I can tell you know it won't stay that tidy for long!! Those lattice backgrounds look really good - sounds like a great machine. 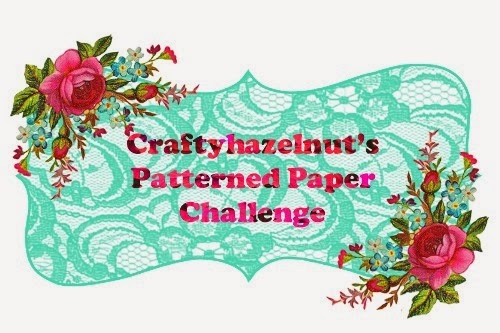 Hazel such a lot of great stuff on your page, love the box, brilliant idea, do have fun with the Scan n cut, and so many pens, looks like a shop! Thanks for visiting me, we had a great day at the show, bank account is groaning! love the reuse of the gardening box, a great idea. Oh Hazel, I'm glad your workspace looks a little more like mine than I first thought! Yours always looks so neat and clean so thanks for posting the pic that shows its not always that way! Glad you had fun with your new toy! Oh and I love Birds cards! She always has the best files! Oh, also, just to let you know, in case you're interested, every Friday on my blog, I publish a list of free cutting files available at various different sites. You can build up quite a collection that way!